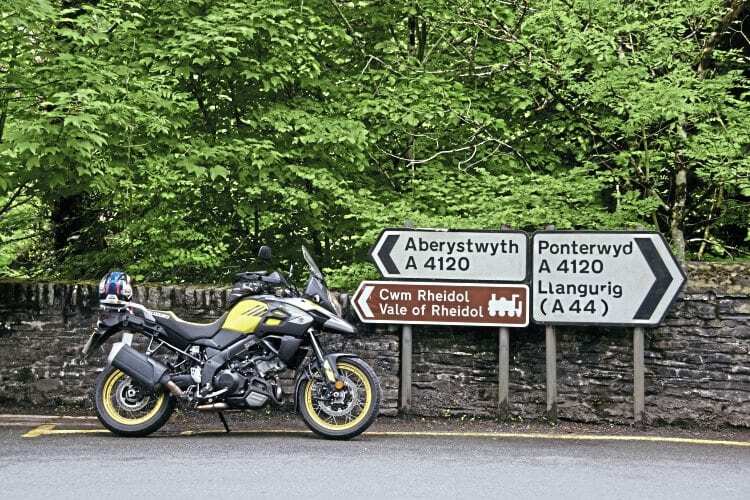 Packing light for a quick two-up ride on the new V-Strom 1000 XT to the Welsh coast and back. It was one of those rare long weekends. The sun was out, I had a test bike still on loan, and for once the wife wasn’t at work and was oddly willing for a bit of time in the pillion seat. We picked the Welsh coast as our destination, as from our home in Worcester we’re straight out into the countryside to get there. A cheap place to stay was found in Cardigan, using www.booking.com for the convenience. We packed a few things in a rucksack, mounted a tank bag to the test bike and away we went; there one day, back the next. The test bike in question was the Suzuki V-Strom 1000 XT. The XT is new for 2017, boasting spoked tubeless wheels, tapered handlebars and not a great deal else over the stock model that has also been updated. The changes are subtle but add to the overall package, with this hopefully the upgrade that sees Suzuki get in among the class leaders of the adventure bike category. In my book the V-Strom 1000 has always been a hugely underrated machine. Given the congestion and city gridlocks lying east of Worcester, the contrast is stark when you head west, past the Malvern hills and out into Herefordshire. There’s nothing much out here but rolling landscapes, plenty of vivid green fields and the occasional medium sized town such as Leominster, or Hereford, depending on which way you head. Fuelling up on the A438 towards Brecon. 20-litre fuel capacity good for 200 miles. We picked a route that would take us to the town of Brecon, jumping off point for Beacons. Traffic was busier than usual, but nothing of any great congestion. Having jacked up the rear preload adjuster I was pleasantly surprised at how the bike still handled on the road. It’s hard to say for certain, but this year the bike seems to have been re-tuned for a slightly softer, more supple ride than the relaunched V-Strom of 2014. As a result it rides very well, serving as a nice reminder that sometimes a well sorted bike is just as good, if not better, than one sporting electronic suspension adjustment with adaptive damping. Engine performance did suffer for having the extra passenger on the back, the 101bhp V-twin just losing that aggression in the midrange that makes it such a hoot when riding solo. Strong four-pot brakes meant no issue in stopping, and despite a slightly tighter bend at the knee for my 5ft 10in wife (than she has on our GS 1200), she was still perfectly comfortable on the back. 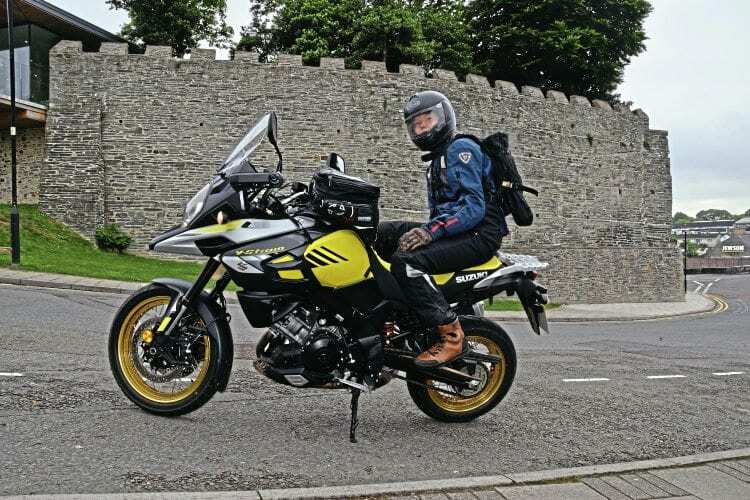 The V-Strom’s keen engine braking did mean that rolling off the throttle could sometimes feel quite abrupt, that thud on the back of the helmet remedied in the most part with more feathering of the clutch and a bit more attention paid on both our parts. The Low RPM Assist function, standard for 2017, seems like a handy new feature, imperceptibly maintaining revs to prevent stalling during slow speed manoeuvres (a drawback of the previous year’s bike), helping you avoid those two-up topples in car parks we’ve all been fearful, or even victims of. We stopped in Brecon for lunch, before heading off in the direction of Ystradgynlais in order to pick up the Black Mountain Road (A4069), found by turning right in the village of Upper Brynamman. This is said to be one of the top riding roads of the UK, but on this Bank Holiday weekend it was somewhat busy and possibly over-hyped, with plenty more good roads in and around the Brecon Beacon area, such as the A470 down from Brecon, making sure to stop for a flaming hot burger at Terry’s burger van at the top. At the summit of Black Mountain Road we parked beside a yellow Suzuki TL1000; the Nineties superbike from which the engine in the V-Strom originally came (in a higher state of tune back then at 125bhp). 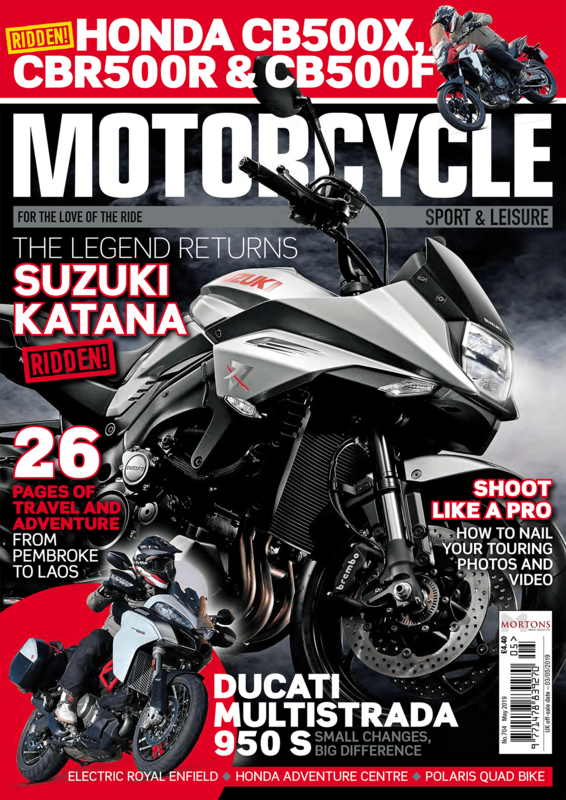 It’s true that in comparison to competition from the likes of Ducati with the Multistrada and KTM with its 1290 range, the engine of the Suzuki is well underpowered for a twin. Indeed, winding those exotic engines out does reward with ballistic speed, but I’m not sure the V-Strom suffers for not having the same. 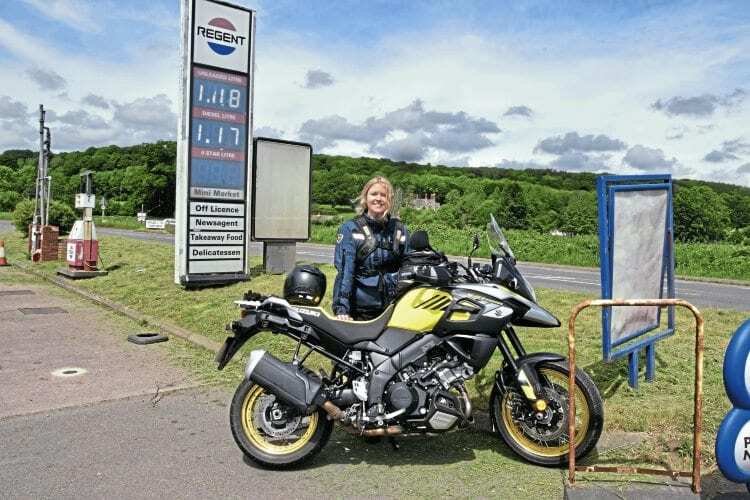 The engine is workable, you can stretch it out without that sensory overload you get with the others, and you do get that feeling with the V-Strom that there is far less to go wrong. Service intervals for the Suzuki are set at every 7500 miles. The route from Black Mountain to Cardigan on the Pembrokeshire coast was a mixture of single track lanes, the type with a grass strip along the middle, to rolling B-roads that seem to criss-cross the countryside with no real direction or focus. It feels very remote out here and would be a great area to explore if you had more time and possibly something more trail friendly to allow you take some of the green lanes that are commonplace throughout mid-Wales. The restored stone wall of Cardigan Castle. Arriving in Cardigan we immediately recognized the 11th century castle by the bridge over the River Teifi as the one to have recently won awards for its restoration work. We stayed at the Teifi Netpool Inn, just along the river in the neighbouring village of St Dogmaels, eating at a picture perfect pub by the river; the Ferry Inn. Travelling light, my wife had to wear her textile trousers to dinner as by now the weather had turned, making it too chilly for a skirt. There is a definite appeal to travelling light, removing so much of the faff of heavily laden panniers. I did pack a puncture repair kit for the V-Strom’s tubeless tyres though, just in case. 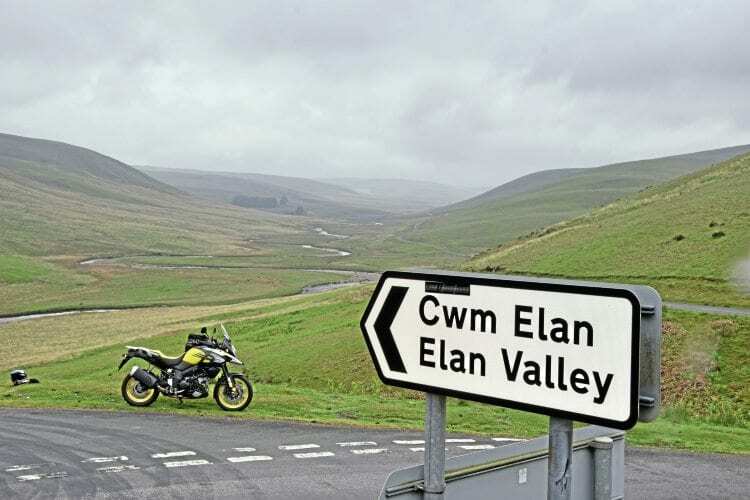 The return leg was via the coastal road to Aberystwyth, then east, along the mountain road passing through Devil’s Bridge and on through the Elan Valley into Rhayader via the B4574. There is a main road, the still picturesque A44, but being in no rush the mountain road was favoured for its views of the valleys below. It also winds past the old metal mines of the 18th and 19th century, the ruined stone buildings of that industry now crumbling back into the earth. Devils’s Bridge Falls is the start of the scenic run into the Elan Valley. Riding along the coast on our way to Aberystwyth, we stopped at the surprisingly picturesque port town of Aberaeron, where many of the houses were painted bright, vibrant colours, with a small fishing harbor at its heart. Families were on holiday there and it seemed something of a hidden gem, a place I’d be keen to return to with more time. 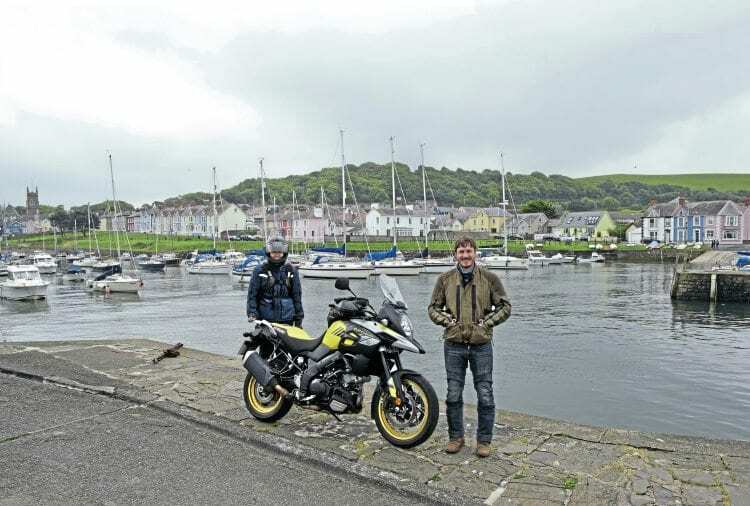 In Aberystwyth we parked beside a lone Triumph 800XC, comparing the size of the two machines and concluding that there wasn’t much in it. They are close on price as well, which could lead you to conclude that at £10,000 for this V-Strom 1000 XT you are getting a lot of bike for the money. Okay, so it’s not high tech (though for this year does have cornering ABS), but for the money you do receive a charismatic engine, sharp handling and distinctive looks that even my wife, who usually hates the look of adventure style machines, was quite taken by. She said that it was the gold rims that did it. 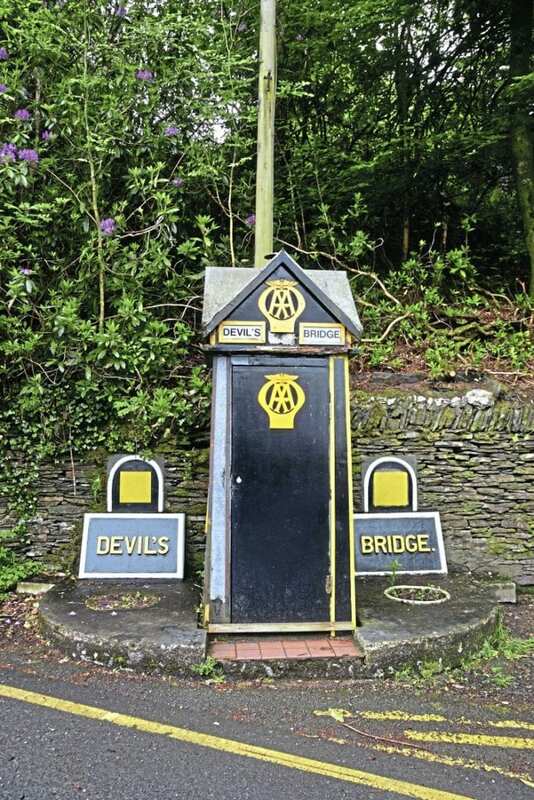 Devil’s Bridge is well worth a visit. So that was that. A quick ride to the seaside and back. About 400 miles total. The bike delivered 50.3mpg and was surprising for its two-up composure. We’ve taken the GS across America, and will soon ride Iceland on it as well. Would I swap GS for V-Strom XT? Not at the moment as I don’t have the equity in the BMW to swap for the Suzuki without putting more money in, and finance I’ve grown tired of. But were I buying brand new, and the thought of saving some money on the bike to spend on a trip instead? Then yes, I think the V-Strom would be my pick. Controversially perhaps, I’d even have one over the new Honda Africa Twin if I wasn’t doing much off-road riding, as for me the Suzuki is the better road bike; crisper handling and a gruntier, more charismatic engine. How does the V-Strom XT fare off-road? A few days later I returned to Wales to ride a trail just outside of Rhayader. It’s a long trail, a mixture of surfaces and challenges and perfect for assessing the larger capacity adventure bikes. Despite the spoked wheels of the XT the bike was just a little bit out of its depth. Fine when the trail was flatter and smoother, but over ruts and bumps the road tuned suspension lacked the control and feel you get with the Africa Twin or GS. You could improve it. Wider, flat footpegs would help, as would bar risers and some proper crash protection. But as it is, the V-Strom XT is very much more better suited to the road. Previous Post:XLmoto’s ‘easy-up’ RACE tent. NEARLY half price.